REDUCED! Detached 3 bed villa with pool Pat� de Cima - Property for sale. Full Description: In a beautifully tranquil countryside location just outside the main resorts is this spacious 3 bedroom villa. 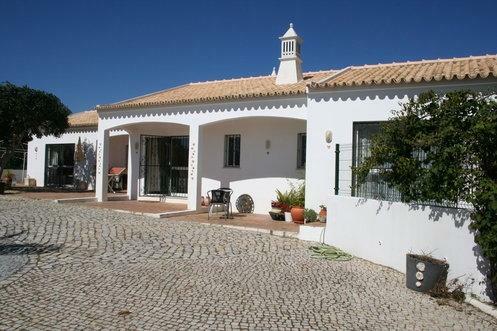 Only 2 minutes from Pata da Cima with local bars and restaurants and all amenities just a few minutes drive away including beaches and golf at Vilamoura, Albufeira and Olhos d'Agua and the airport at Faro the location is perfect for idyllic holidays or permanent living. The villa is bungalow style all on one level and comprises 3 double bedrooms with fitted wardrobes, the master with large en-suite bathroom complete with bath and separate shower, the other bedrooms each with vanity unit and wash basin which is a nice feature. There is another full bathroom again with separate bath and shower cubicle, hallway currently used as an office space, lounge with wood burner, dining area and a fully fitted and equipped kitchen with utility/storage room. All main rooms have patio doors to terraces or seating areas and the house is full of natural sunlight as there are plenty of windows. Outside, the plot is completely fenced and enclosed. There is a calcada parking area accessed through gates at the front of the villa, swimming pool with sunbathing terraces and a large garden with mature pine trees, shrubs and flowers with shaded seating area and feature lighting. In the garden is a large wooden shed, previously used as a work room with phone connection, now used as storage. This really is a lovely property, maintained to a very high standard and viewing is highly recommended.